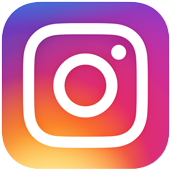 Home › Stories › Pregnant Woman Interrupts Family’s Photo Shoot And Reveals A Shocking Secret. 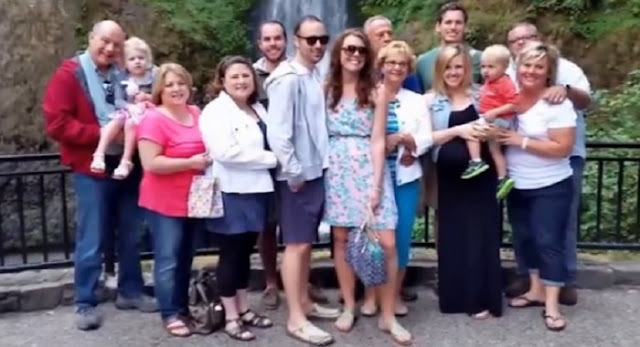 Pregnant Woman Interrupts Family’s Photo Shoot And Reveals A Shocking Secret. Holly and Darren were over the moon when they discovered they were pregnant with twins a few years ago. However, that happiness soon turned to sadness when Brinly passed away at 18 weeks and Jude followed just three weeks later. 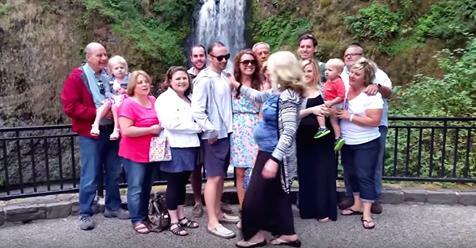 A year after their tragedy, they invited their families to pay respect to their twins at Multnomah Falls, outside Portland, Oregon. Little did their families know that the couple had more in store for them than a memorial service. Holly and Darren hadn't told anyone, but they had taken their friend up on a very special offer: surrogacy. The couple's embryos were transferred successfully, but the couple kept quiet about the pregnancy following their devastating previous pregnancy. However, when she reached the 24-week mark, they decided to let everyone in on the happy surprise. As they gathered the whole family together for a group photo, they were joined by an obviously pregnant stranger. Things got even weirder for the family when Holly began to rub the stranger's belly. Luckily, they let everyone in on the secret before it got too strange — and they got the reactions all caught on film! What an incredible way to break the (happy) news. As soon as everyone processed what Holly was saying, they welcomed the stranger with open arms and happy tears. As for the chance at surrogacy, Holly told , "It was one of the most amazing things a human could have done for us. The lady that did it was 46 at the time and refused to take any money from us. In fact, we agreed we would pay all medical bills, but she and her husband paid the $5,000 C-section bill as a gift."